Skim over the sands and causeway to Holy Island and prepare to enter another world. Lying just a few miles off the Northumberland coast, Holy Island as seen on Robson Green’s Tales from Northumberland is cut off twice-daily from the rest of the world by fast-moving tides. 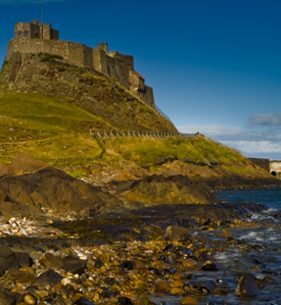 Both an island and a picturesque village, Holy Island carries a wealth of history within its tidal walls. See one of the region’s most revered treasures Lindisfarne Priory. The epicentre of Christianity in Anglo Saxon times, Lindisfarne Priory was once the home of St Oswald. This serene setting was the birthplace of the Lindisfarne Gospels, one of the world’s most precious books. Ransacked by marauding Viking raiders in the 8th century, the evocative ruins of Lindisfarne Priory includes the famous ‘rainbow bridge’ which spirals skywards with the ghost of a long-vanished tower. Holy Island remains a place of pilgrimage today. The island is the final destination of long distance walking route and one of Scotland’s Great Trails, the St Cuthbert’s Way. Rising from the sheer rock face at the tip of the island is Lindisfarne Castle. Built to defend a harbour sheltering English ships during skirmishes with Scotland, the castle caught the eye of Edward Hudson, founder of Country Life magazine. Celebrated architect Edward Lutyens gave the castle a luxurious makeover turning it into a comfortable but quirky holiday home. Explore the castle’s rooms today, which remain largely unchanged. Aside its historical pedigree, the Holy Island of Lindisfarne has an exciting array of wildlife. Its island status protects tidal mudflats, saltmarshes and dunes which together form the Lindisfarne National Nature Reserve. Rare plants and an abundance of food supplies attract visiting birds from thousands of miles. Autumn is the best time to look out for internationally important species of wildfowl and wading birds that overwinter on the reserve. Spot pale-bellied brent geese flying in from Svalbard (Spitsbergen), pink footed and greylag geese, wigeon, grey plovers and bar-tailed godwits are just some of the island’s other visitors. Grey seals bob in the waters here and can be spotted sunning themselves on the sands, joined by the occasional common seal. A word of caution: Be sure to check for safe crossing times on the causeway’s notice board before journeying to Holy Island. Berwick Tourist Information Centre has full details of both the tides and bus service to the island.